You are here: Home / Healthcare opportunities / Aging / Aging “gray tsunami”: challenge or opportunity? Aging “gray tsunami”: challenge or opportunity? I have been doing a lot of work over the last year or two on projects that relate to our growing elderly population, and the seductive idea that novel technology may somehow make the life of the aging population better, and perhaps the care of the elderly cheaper. The demographics are typically framed as “a challenge”. I have decided it is more useful to frame the upcoming “gray tsunami” as an opportunity. Aging: Is the glass half empty or half full? 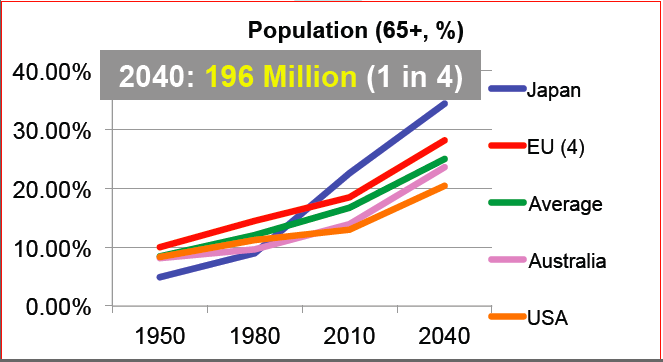 Challenge: Large and growing population of elderly people. Fewer young people to take care of them. Less and less spare money in the wealthy world economies to pay for aging services. Predictions of shortages of doctors, nurses, and caregivers. Opportunity: Affluent baby boomers want it all, and have lots of assets. With powerful computers in everyone’s pockets (smart phones and tablets), low cost, pervasive networking and communication, and rapid advances in fields like robotics, there should be huge opportunities for technology to do what people cannot or will not do anymore, and transform the lives of these young-at-heart boomers. – if it is the market who drives the technology, then it should be very advantageous for the market to increase the number of users by adding new members in face of elderly people and people with perception disabilities, including handicap, deaf, blind, autist and dyslectic. – if it is not the market who drives the technology, but human goodwill does (like in this case http://www.naturalnews.com/040624_cancer_industry_documentary_lies.html), then the unintentional discrimination of humans by their age and information perception abilities from the rest of the world must end up soon!